Qty is 4pack Damp Rid Hanging Moisture Absorber Fresh Scent Bag 14 oz. *Size: 14 ounce • Fresh Scent, hang moisture absorber • Attracts and traps excess moisture • Eliminates musty odors • Creates fresher, cleaner air BTI trading was established in year of 2012.We are allocated at US WA.The transportation to our store is very convenient.we are selling only high quality products we also selling our products world wide .At BTI we sure you can find all the product that you want. Damp Rid FG30K Moisture Absorber Refill, 42 Oz. Refill for SKU # 70252. Eliminates musty odors caused by excessive moisture. Prevents mold & mildew stains. 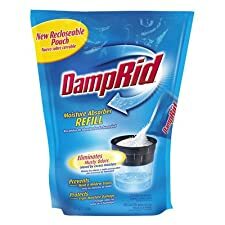 Damp Rid, 42 OZ, Lavendar Vanilla Scent Refillable Moisture Absorber, Prevents Mildew, Mold and Musty Odors By Drying The Air To A Level Where Milder and Mold Cannot Grow, Odorless, Non Toxic, Can Be Refilled and Reused. Easy fill system is perfect for any room moisture absorbsion. Prevents mold and mildew stains. Locking lid and anti-spill design. Great for clothes closets, bathrooms, laundry rooms, basements, garages, boats and more. A way to eliminate musty odors for long periods of time (one 10.5 oz. FG92 refill packs) lasts up to 60 days. 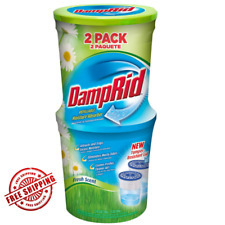 DampRid Easy-Fill Any Room Moisture Absorber uses a convenient and disposable Easy-Fill Refill pack that drops into the container without having to touch the formula; making it easy to eliminate musty odors and create fresher air in the home. WARNING: This product can expose you to chemicals which is [are] known to the State of California to cause cancer and birth defects or other reproductive harm. For more information go to www.P65Warnings.ca.gov. Pack of two 18 ounce DampRid Moisture Absorber with Activated Charcoal. DampRid crystals and Activated Charcoal come together to create an amazingly effective solution for both removing moisture and odors. Activated charcoal absorbs and removes odors from cooking, garbage, bathrooms and diaper pails. Attracts & traps excess moisture; Eliminates musty odors. Creates fresher, cleaner air; Ideal for bathrooms, bedrooms, kitchens, closets, laundry rooms or anywhere moisture is a problem. DampRid crystals and Activated Charcoal come together to create an amazingly effective solution for both removing moisture and odors! Activated charcoal absorbs and removes odors from cooking, garbage, bathrooms and diaper pails. 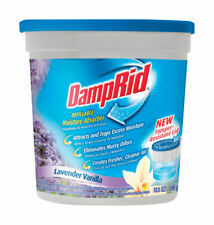 And unlike sprays and candles, DampRid doesn't just mask odors, it eliminates them. 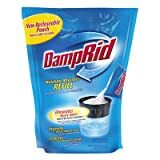 DampRid is the all-natural way to absorb excess moisture in the air that can cause stale air, musty odors and damage your household possessions. DampRid's crystals absorb the moisture in the air to create and maintain the optimal humidity level in your home, cabin, boat, and car- or wherever moisture is a problem. t's an effective one-two combination that creates fresher, cleaner, odor-free indoor air! WARNING: This product can expose you to chemicals which is [are] known to the State of California to cause cancer and birth defects or other reproductive harm. For more information go to www.P65Warnings.ca.gov. Damp Rid FG83K or FG83LV Hanging Moisture Absorber - 3 Pack DampRid NEW! !